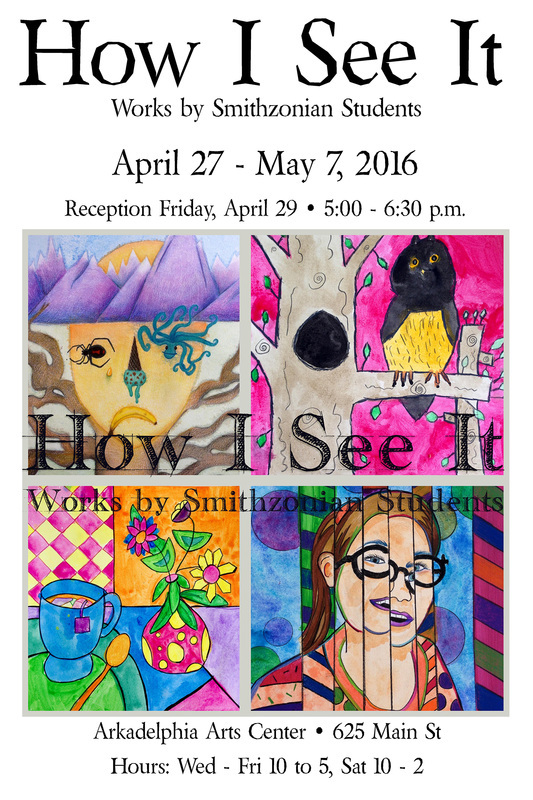 Reception: Wednesday, April 17th, 4:30 to 5:30 p.m. Opening Reception for the public: Tuesday, April 2nd, 4:30 to 6:00 p.m. The paintings by Group Living, Inc client Roy Marion display intricately patterned designs and vivid colors, all created since January 2019. A tribute to Black History Month, Looking Back While Moving Forward features pen and ink with color creations of Dr. Charlene Claye, and the African-American and Black culture collections of Dr. Carolyn Hunter. Center hours: Tuesday through Friday, 10 to 5. Thursday, February 28th, 4:30 to 5:45 p.m. Speakers to begin at 5:15 p.m.
​ by Audrey Sosebee Dixon, 1913 - 2006"
"Heirloom Treasures: Vintage Quilts by Audrey Sosebee Dixon (1913 - 2006)" is on display now through January 25, 2019 at the Arkadelphia Arts Center. Please stop by and see these wonderful quilted creations, both traditional and original designs. Several are Christmas themed! Audrey is the mother of longtime Arkadelphia resident Bill Dixon. There is also a quilt on display by Bill Dixon's wife's (Snookie's) grandmother. Reception for the public, Wednesday, November 7th 4:30 to 5:30 p.m.
October brings displays of fall foliage, pumpkins and chrysanthemums. It also is the time to see displays of a wide variety of art at the annual Round About Artist Studio Tour. Held each year on the third weekend in October, tour artists welcome visitors to their studios to see their latest creations and tools of the trade. This year marks the twelfth year of the tour, sponsored by the nonprofit Caddo River Art Guild, and features 17 artists specializing in mediums such as watercolor, photography, ceramics, oil and acrylic painting, fiber art, art glass, wood carving, basket weaving, jewelry, and sculpture. Some of the artists have grouped up at the Arkadelphia Arts Center and the Diamond Lakes Regional Visitors Center (Caddo Valley). There are also two husband and wife teams who share studios, making the total number of locations at eight. Visitors can see all eight locations quickly in one afternoon, or at a more leisurely pace taking in the ambiance of the settings along with the art on view. Art will be for sale, so keep your holiday gifts list in mind. 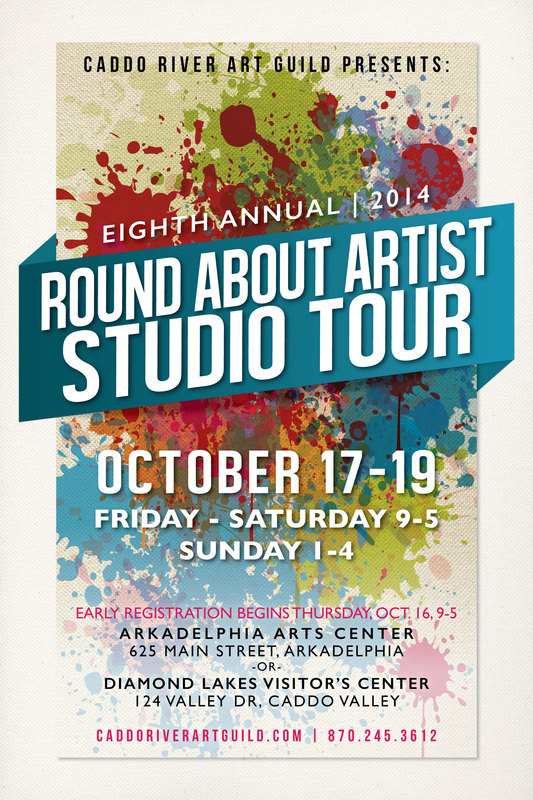 Folks interested in taking this free tour may pick up a guidebook with map to the studios beginning Thursday, October 18 from 10:00 a.m. to 5:00 p.m. at either the Arkadelphia Arts Center, 625 Main Street, or at the Diamond Lakes Regional Visitor’s Center, Caddo Valley (next to Fat Boys Restaurant). Tour hours are Friday and Saturday, 9:00 a.m. to 5:00 and Sunday 1:00 to 4:00. For more information on the artists and sponsors go to www.CaddoRiverArtGuild.com or call 870-245-7982. Collections from area residents are on view including many unusual items. Don't miss this one! Stitchery Spectacle, folks working on their stitched creations and showing their finished works. Quilting, knitting, felting, yarn art and more are represented. Watch artists as they paint outdoors "en plein air" in downtown Arkadelphia and inside the Arkadelphia Arts Center on rainy days and hot afternoons. Arts Center hours may vary during this event as artists come and go. ​Normal hours are Tuesday through Friday, 10 to 5. Student art from Goza Junior High School, Arkadelphia, Arkansas, grades 6th through 8th. Photography from Ouachita Baptist University international student Artemii Orekhov, capturing special moments and experiences from Artemii's travels abroad and in the United States. Beautiful batik fabrics - a tribute to the century-old handmade designs and patterns on textiles that originated in Indonesia and were copied and industrialized by Europeans and exported to Africa. Reception for the public, Wednesday, November 1, from 4:30 to 5:30 p.m.
Six years of exhibits and events seen through photographs and show posters. Opening Day, Wednesday, June 28, 4:30 -6:00 p.m.
Now on display at the Arkadelphia Arts Center is "Fashion Extravaganza", a compilation of costumes and vintage clothing collected from Henderson State University and Ouachita Baptist University Drama departments, the Clark County Historical Museum and from several local collectors. Costumes depicting the 1700's through current fashions are exhibited with a wide variety of accessories including purses, shoes, gloves, Sarah Coventry jewelry, and more. Students of Smithzonian Art Center, ranging in age from first grade to senior adult, will be showing some of their favorite artwork in a wide variety of media. The colorful creations from Goza Middle School, grades 6 - 8, will be on display through Friday, May 19th. Light and Color showcases student work made during a recent Study Abroad course in Central Mexico. Ten Henderson State University Photo 2 students focused their lenses on the sights, streets, colors and culture of Mexico City, San Miguel, and Oaxaca. ​ southwest region of Arkansas. The Arkansas Women to Watch features unique contemporary interpretations of Nature, a historic theme for women artists. The artwork invites contemplation of approaches that go beyond traditional landscape and still life paintings to include photography, painting and drawing, and mixed-media porcelain installation. Sammy uses a technique of applying crayon, scraping it off and reapplying creating bold and colorful images. He is set apart from other artists not only because of his talent, but also because he has an intellectual disability. Sammy is almost completely non-verbal yet his art conveys a profound self-awareness and view of the world and people around him. ​Roy is heavily influenced by the seasons and the people around him. He paints large door sized images of people and he sculpts small whimsical figurines that put a smile on your face! Holiday items for sale. 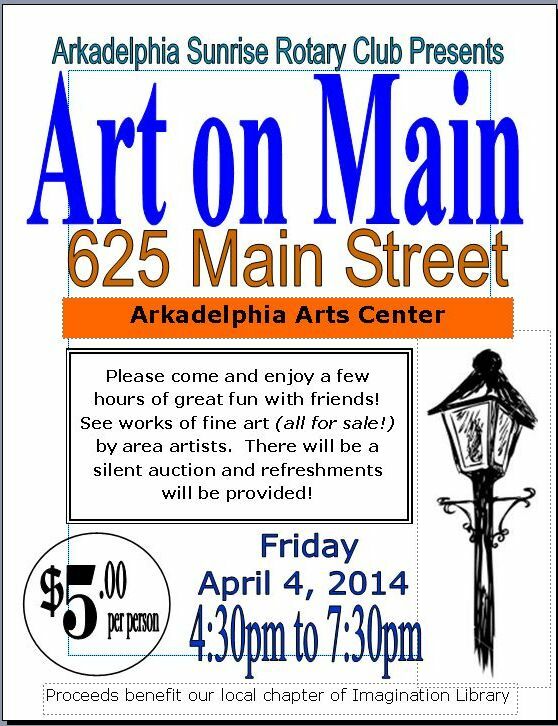 Proceeds from this event help run the Arkadelphia Arts Center. Sponsored by the Clark County Arts and Humanities Council. Point of View is a group show of Advanced Photography students from Henderson State University. The work from six students explores personal points of view into a topic of their choosing. The photos in this show provide an in-depth look into rural farm life, everyday heroes, light and form, and personal psychology. Students work with both digital and analog techniques, color and black and white photographs. 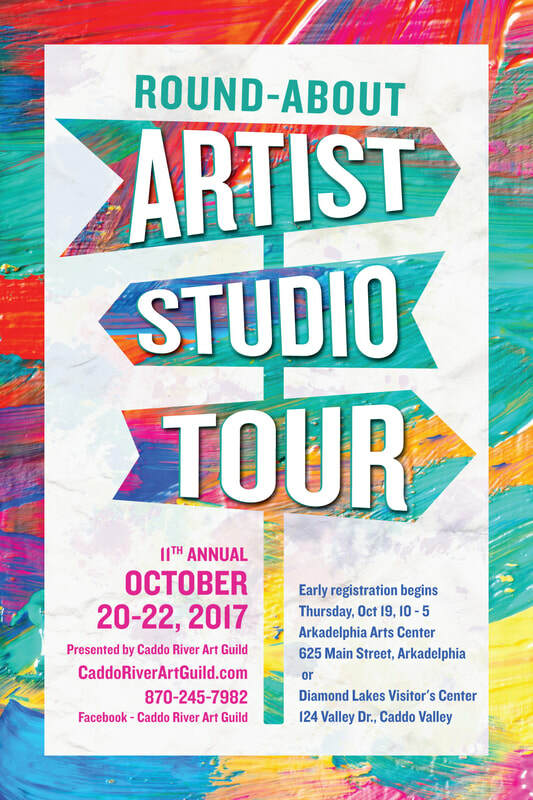 The Caddo River Art Guild hosts the 10th Annual Round About Artist Studio Tour, a self-guided driving tour to the studios of local artists. See their working environment, demonstrations, and original creations including painting, wood working, jewelry, fused glass, fiber art, basket weaving and more. 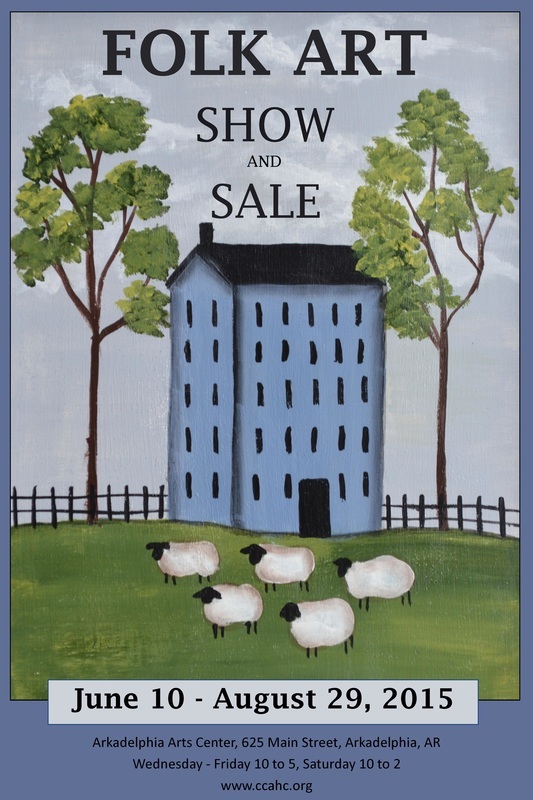 Art will be for sale so bring your shopping list! Visit each artist to qualify for cash prizes, celebrating the tour's 10 years! Original images designed, drawn, and created by artist Edwin Martin using a block, stone, screen, plate or other medium to hand pull each piece. ​Nearly 200 items of varying art forms are represented in the show. All handcrafted by local artisans and skilled craftsmen, the art pieces showing include wood carving, pottery, woven baskets, quilting, musical instruments, duck and turkey calls, tole painting, jewelry, bird houses, metal forged items, and collages. Henderson State University senior Willow Hinson. Visual panels depicting a collective memory of growing up in Arkansas from 1890 to 1980 told by the people who did it, and conveying the importance of passing family histories from one generation to another. On loan from The Department of Arkansas Heritage. These creative and colorful art pieces from Goza Middle School 6th, 7th, and 8th grade students, will be on display from Wednesday, May 11th through Saturday, May 21st. ​Reception: Thursday, May 12th, 4:30 to 5:30 p.m.
​in Arkadelphia encompasses works by first year students to advanced artist, first graders to senior adults, watercolor to clay, and plenty in between. A reception will be held on Friday, April 29th, 5:00 to 6:30 p.m. with awards announced at 6:00. The public is invited. 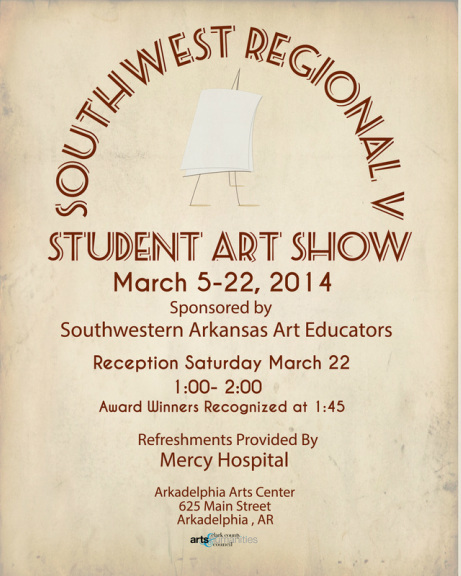 The Arkansas Art Educators Southwest Regional Student Exhibition represents kindergarten through 12th grade students from ten school districts in the southwest area of Arkansas. A reception will be held on Saturday, April 16th from 1:00 to 2:00 with award winners recognized at 1:45. Free and open to the public. 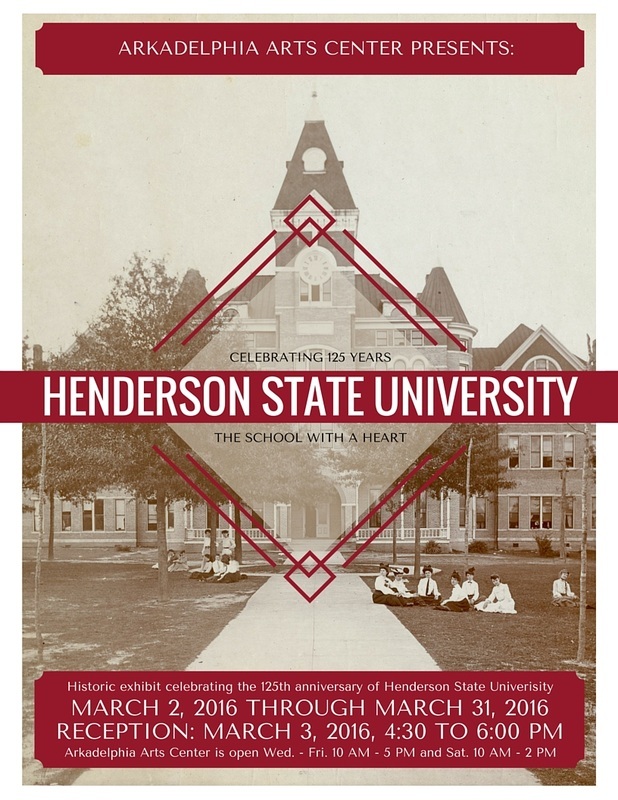 Celebrating the 125th anniversary of the founding of Henderson State University, Arkadelphia, Arkansas. A special display of photographs and memorabilia will highlight events in the history of the institution. Presenting a diverse collection of contemporary art by local artists. The art pieces range from digital prints to realistic and abstract creations. The exhibit introduces the viewer to the diversity of the arts and artists in our community. ​Sponsored by the Clark County Arts and Humanities Council, a non-profit organization. Fabulous finds and great prices on wreaths, holiday decor, paintings, toys, Christmas trees, and much more! 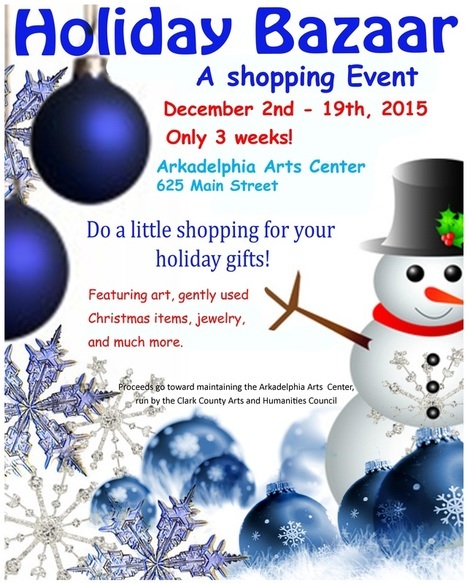 Help support the arts in Clark County by shopping at the Arkadelphia Arts Center during these 3 weeks. Sponsored by the Clark County Arts and Humanities Council, a non-profit organization. 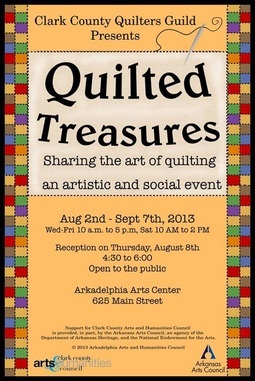 Currently on exhibit at the Arkadelphia Arts Center, "Quilting Treasure - A Batik World", is a grand display of colorful quilts designed and made by members of the Clark County Quilter's Guild. Showing is an array of patterns and styles of quilts with many of them using batik fabrics, a method of producing colored designs on textiles by dyeing, having first applied wax to the parts to be left undyed, then removing the wax. Clark County Arkansas has exceptional art instructors ranging from teachers in the public and private schools and universities to those offering private lessons. This exhibit features their work and gives our community an opportunity to see the creativity of those teaching the skills necessary to produce visual art. Thursday, June 18, 4:30 - 6:00 p.m.
Patricia Horton, Scooter Orsburn, and George Baker. 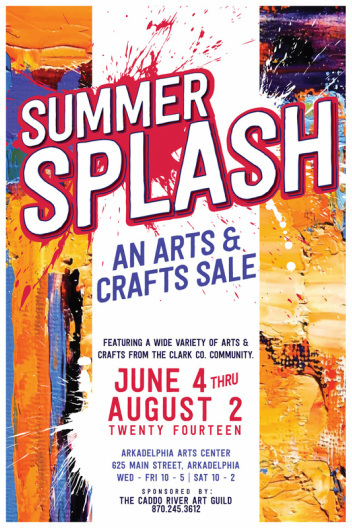 Most of the art will be for sale with proceeds going to the non-profit Clark County Arts and Humanities Council, which runs the Arkadelphia Arts Center, 625 Main Street, Arkadelphia. 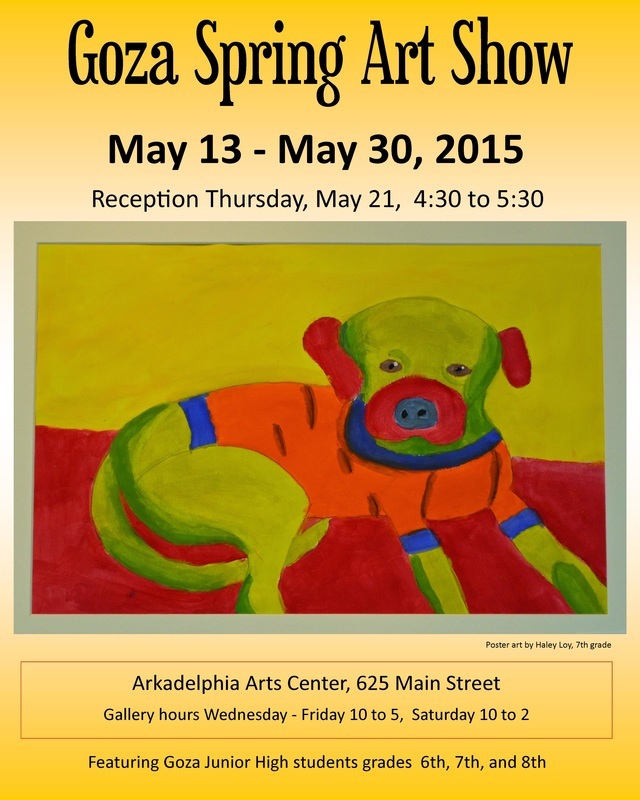 Goza Spring Art Show 2015 is now showing at the Arkadelphia Arts Center, 625 Main Street, Arkadelphia. The exhibit includes colorful and creative work done by Goza Junior Hight 6th, 7th, and 8th grade art students throughout the school year lead by art teacher Shirley Howard. 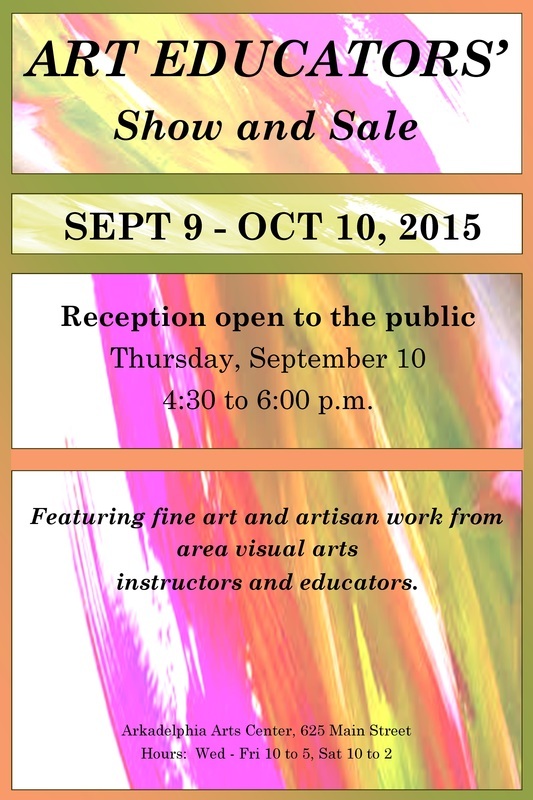 Arts Center hours Wednesday through Friday 10 to 5, Saturday 10 to 2. An intimate look at the lives of three Advanced Photography students from Henderson State University. Each artist uses their camera to examine the people, places, and ideas that shape their experience. Through their lens, viewers get a peek into individual stories which are common to us all. Colorful and creative art from kindergarten through 12th graders representing eleven schools in southwest Arkansas. First place winners will continue to the state show. 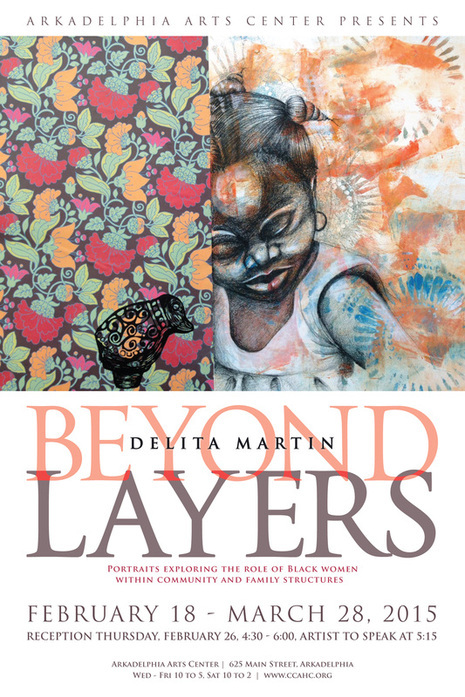 Beyond Layers features portraits of black women within community and family structures. Artist Delita Martin has paired her portraits with domestic objects - spoons, bottles, bowls - to help tell her stories. The added layers of printmaking, collage, and sewing add depth to each surface and to each story. "My process of layering various printmaking, drawing, sewing, collage, and painting techniques allows me to create a holding space where my symbolic language and identities converge creating a new filter for interpretation and offering other narratives for women who have historically been marginalized." 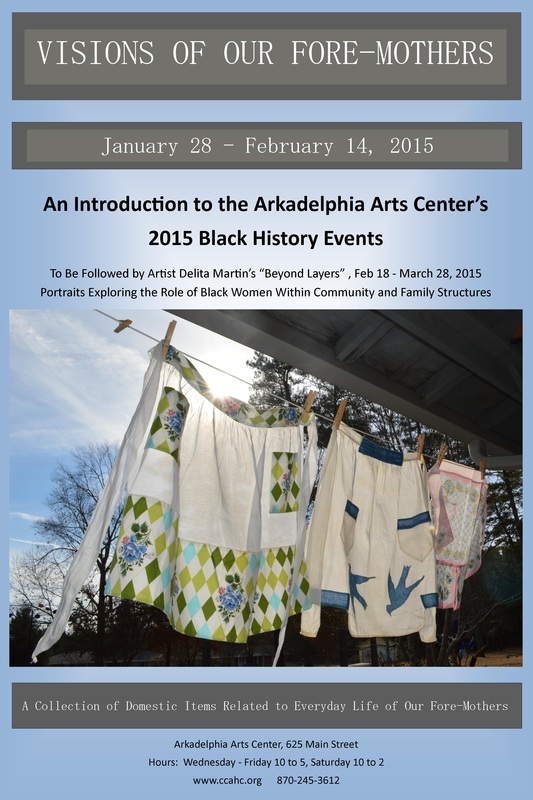 VISIONS OF OUR FORE-MOTHERS, an introduction to the 2015 Black History Events for the Arkadelphia Arts Center, focuses on domestic items related to the everyday life of our fore-mothers. Included in the exhibit are hanging quilting frames from the early 1900's, a collection of vintage aprons, and much more. 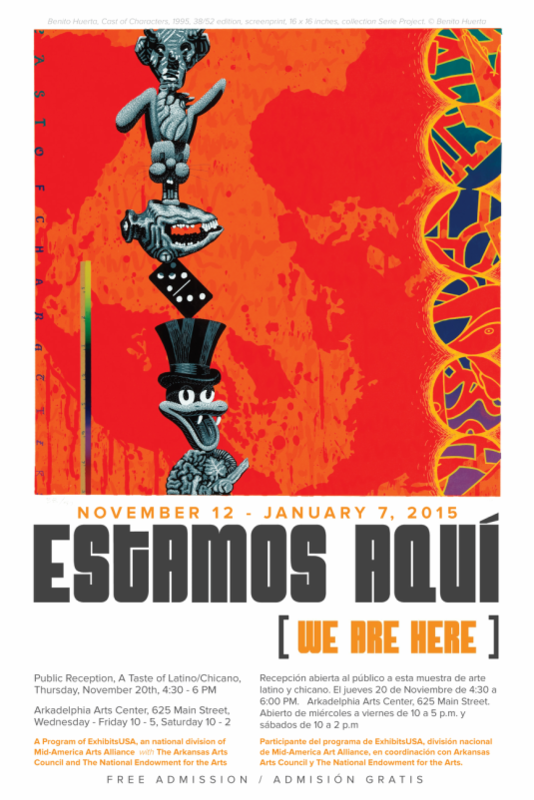 Estamos Aqui (We Are Here) features contemporary serigraphs by artists who took an opportunity to learn a specialized silkscreen print technique from a collaborative Austin-based residency. Many of the artists are speaking from the Latino perspective, and the resulting portfolio of prints expresses their celebrations, sorrows, challenges, popular culture, and personal experiences. Featuring vivid colors and sometimes startling imagery, the works in Estamos Aqui (We Are Here) encourage audiences to ask questions about the nature of cross-cultural exchange and discover how artists find their voice through personal stories and experiences that become part of the artistic process. 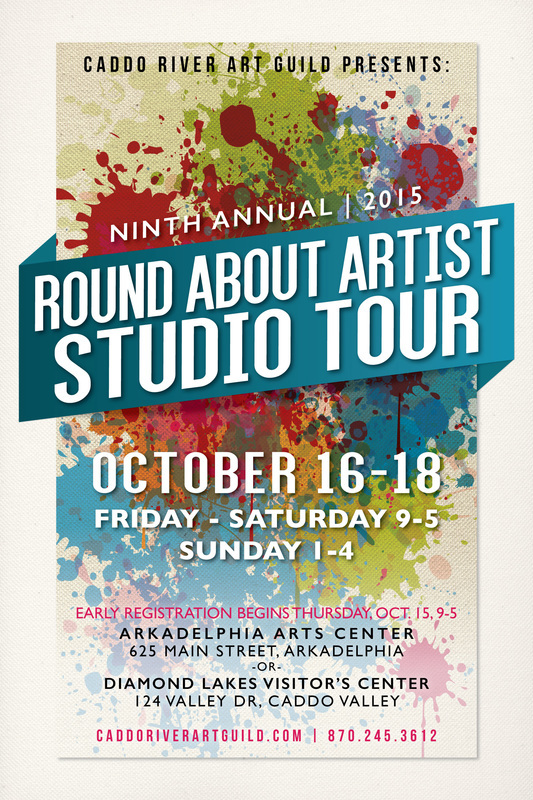 Pick up a free guidebook with directions to the studios of Arkadelphia area artists at one of two locations: the Arkadelphia Arts Center, 625 Main Street, Arkadelphia or at the Diamond Lakes Regional Visitor's Center, 124 Valley Road, Caddo Valley. This free self-guided tour takes you to the private studios of area artists offering a variety of art to experience and purchase including painting, fiber art, temari, wood carving, photography, jewelry and more. Sponsored by the Caddo River Art Guild. For more information go to www.caddoriverartguild.com or call 870-245-3612. The exhibit explores Arkansas' natural and artistic heritage and inspires viewers to celebrate the beauty that can be found in their own backyards. It consists of 18 large colored pencil drawings, detail drawings, and photo-documentations of depicted trees. The art work is accompanied by short anecdotes and stories to encourage multi-generational conversations. 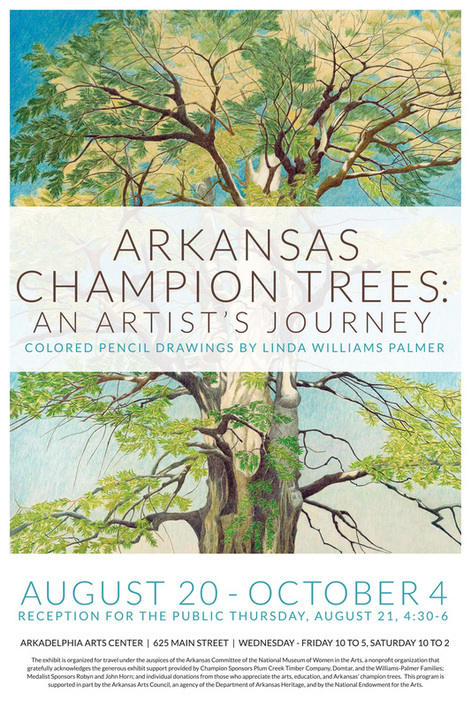 ﻿This exhibit is organized for travel under the auspices of the Arkansas Committee of the National Museum of Women in the Arts, a nonprofit organization that gratefully acknowledges the generous exhibit support provided by Champion Sponsors Plum Creek Timber Company, Domtar, and the Williams-Palmer Families; Medalist Sponsors Robyn and John Horn; and individual donations from those who appreciate the arts, education, and Arkansas' champion trees. This program is supported in part by the Arkansas Arts Council, an agency of the Department of Arkansas Heritage, and by the National Endowment for the Arts. May 6, 2014 6:00 p.m. 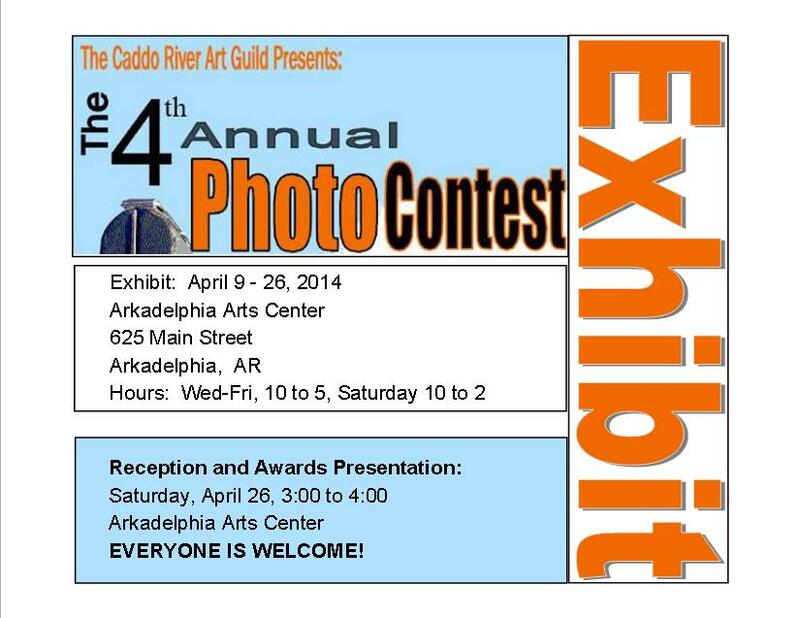 The April show at the Arkadelphia Arts Center, "The 4th Annual Photography Contest", sponsored by the Caddo River Art Guild, is up and will be hanging through Saturday, April 26th, 2014. The gallery space is filled with 199 fabulous photographs including 2 age divisions (youth and adult) and 5 subject categories. 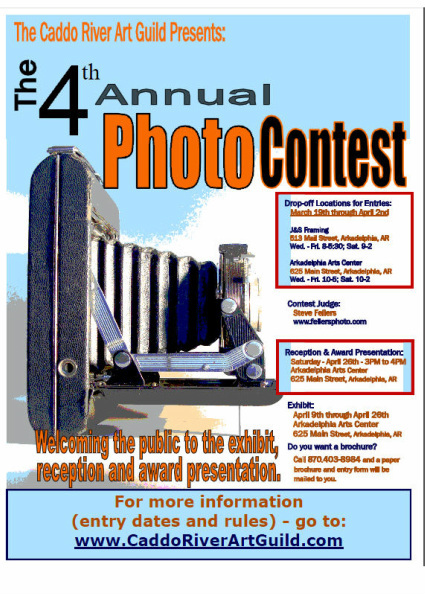 There are entries from all over the state of Arkansas and many of these folks will be at the reception and awards presentation on Saturday, April 26th, from 3:00 to 4:00. Please come by and see the exhibit, vote for a People's Choice photograph, and support the Clark County Arts and Humanities Council and their efforts to bring arts to the community and the community to the arts! Displayed is colorful and creative art from kindergarten through 12th graders from nine school districts in southwest Arkansas. Celebrating Archaeology Month in March, with the theme of American Indians, the Clark County Historical Association will present speaker Amanda Paige of the Arkansas History Commission. She will be speaking on "Chickasaw Removal Through Clark County, Arkansas", Wednesday, March 12, 2014, 1:30, at the Clark County History Museum, 750 S. 5th Street, Arkadelphia, AR, 870-230-1360. 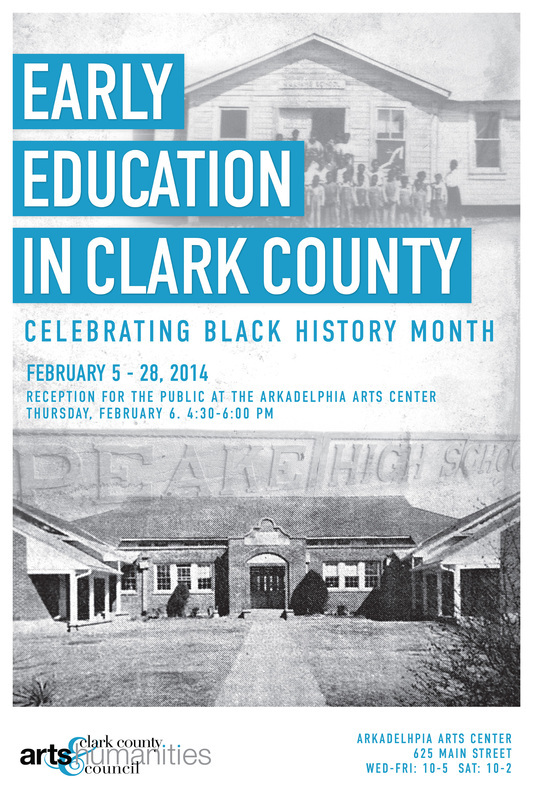 "Chickasaw Removal Through Clark County, Arkansas"
"EARLY EDUCATION IN CLARK COUNTY"
The Arkadelphia Arts Center is celebrating February Black History month with “Early Education in Clark County”. The exhibit takes the viewer through a pictorial history of African-American education from the mid-1800s to the present with emphasis on the Peake Rosenwald school. The exhibit opens February 5 and ends February 28. Admission is free. Arkadelphia Arts Center, 625 Main Street, hours are Wednesday through Friday 10 a.m. to 5 p.m. Saturday 10 a.m. to 2 p.m. For more information, call (870)245-3612. "Sometimes All That Remains Are Visions and Dreams: School Days in Clark County, Arkansas (1920-1930)"
Sponsored by the Henderson State University's Jane Ross Photography Project, the exhibition features a series of prints created by photographer and artist Rhonda Berry. 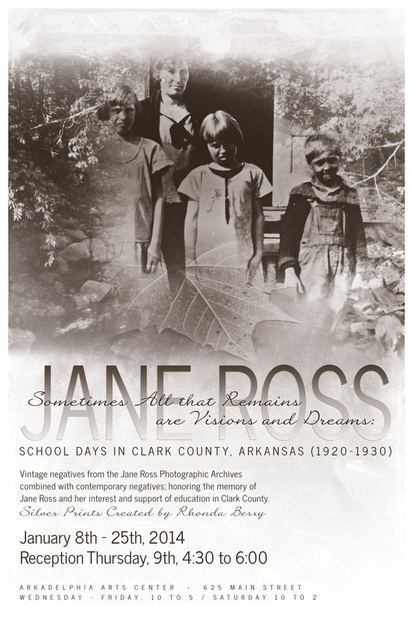 Berry's interpretive photographs utilize images from large format copy negatives of Clark County Schools (circa 1920-1930) that are a part of the Jane Ross Photographic Archive, which is housed at Henderson State University. She has combined the vintage negatives from the collection with contemporary negatives she exposed at the school sites and the surrounding countryside. The images embody layered memory of people, landscape, the schools and of times gone by. In choosing the "Old Schools" imagery, the exhibit honors the memory of Jane Ross and her interest and support of education in Clark County as well as her professional enthusiasm for the world of photography. 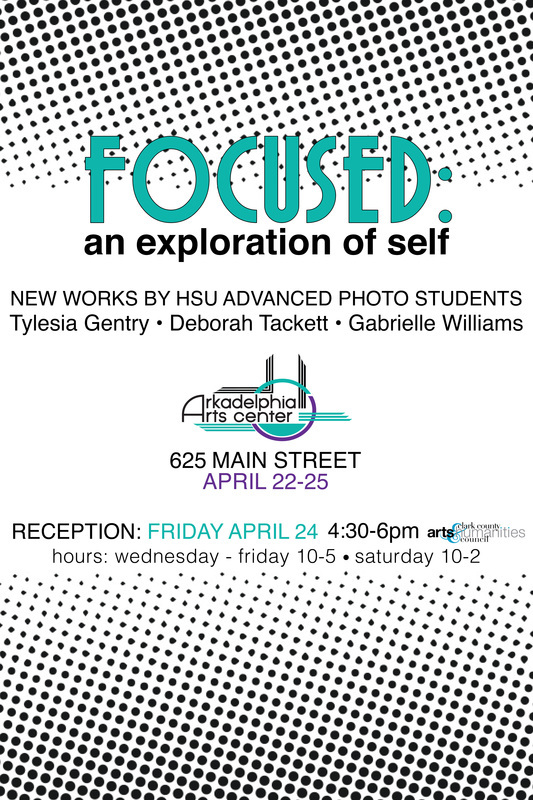 Beverly Buys is Director and HSU Faculty Advisor for the Project, Rebecca Hall Fulmer is curator and writer for the Project and Rhonda Berry is printer, photographer and artist for the exhibition. 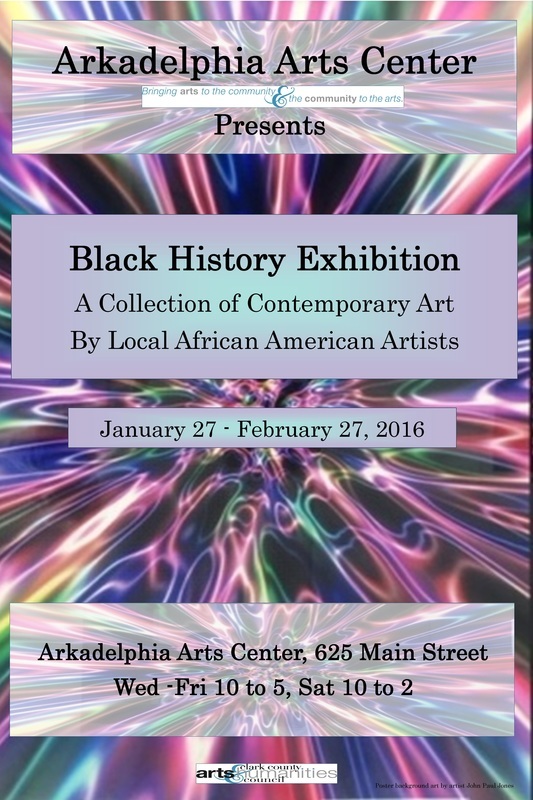 Arkadelphia Arts Center, 625 Main Street, hours Wednesday through Friday 10 to 5, Saturday 10 to 2. For more information call 870-245-3612. 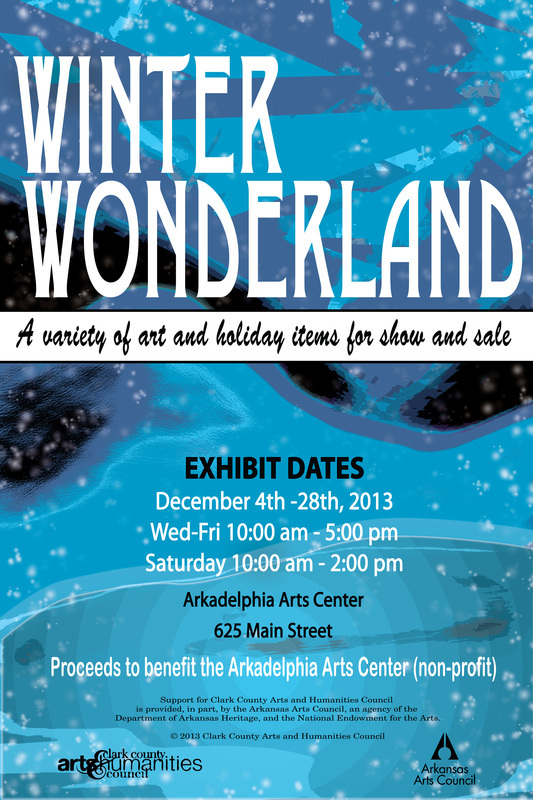 Now showing at the Arkadelphia Arts Center is the Winter Wonderland show and sale. There will be a variety of works from local artists featuring winter themed art. Our gift shop area will have a variety of holiday items available for purchase. The show will run December 4th through the 28th. Center hours are Wednesday through Friday, 10 am to 5 pm and Saturday, 10 am to 2 pm. For more information, call 870-245-7982. This exhibit features recent work created by students enrolled in Visual Art Departments of Henderson State University and Ouachita Baptist University. There will be a diverse selection of artwork from a variety of mediums that will be available for sale. 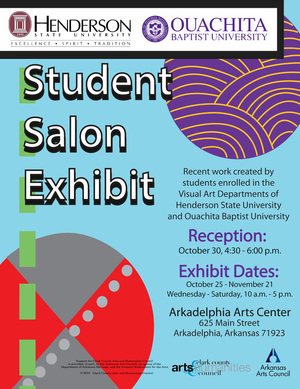 A reception will be held at the Arkadelphia Arts Center on Wednesday, October 30th, from 4:30 to 6:00. The show will run October 25th through November 21st. Center hours are Wednesday through Friday, 10 am to 5 pm and Saturday, 10 am to 2 pm. For more information call 870-210-5235. 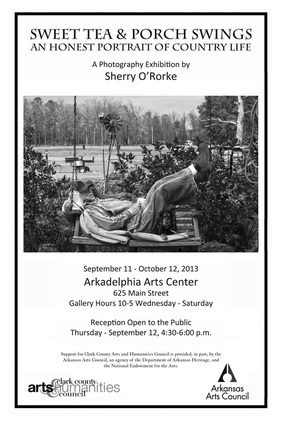 The Arkadelphia Arts Center, 625 Main Street, is holding a reception for the current exhibit, “Sweet Tea and Porch Swings”, a photography exhibition by HSU art major and long-time Arkadelphia resident Sherry Harmon O’Rorke. Ms. O’Rorke will be sharing her view of country living in rural Arkansas through her photographs, which include not only digital images, but also cyanotype, van dyke brown, and traditional silver gelatin prints (B&W). This honest and intimate glimpse into country life is one that should not be missed. Open to the public. 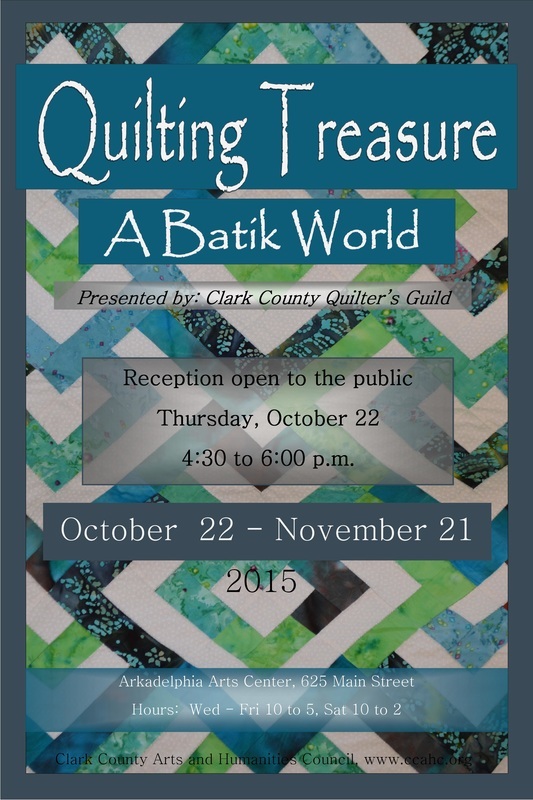 The public is invited to Quilted Treasures, an artistic and social event displaying the talent of the Clark County Quilters Guild. Included are a number of quilts made through a variety of methods using tools that will also be shown as part of the exhibit. Additionally featured are the Quilts of Valor crafted specifically for US veterans. This unique showcase of quilts is one that should not be missed. Summer hours are Wednesday through Friday 10 to 5, Saturday 10 to 2. For additional information call 870-210-5235. 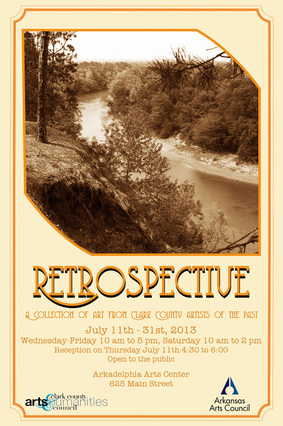 "Retrospective" includes over 80 paintings, photographs, prints, ceramics, and sculpture by 20 Clark County artists of the past including many representations of the Desoto Bluff, an Arkadelphia landmark. Charles Richardson, a noteworthy Arkadelphian who painted in the 1920's through the 1940's is represented with 17 of his original oils. The wide variety of subjects and styles is a must see. "Retrospective" dates, July 11 through 31, summer hours are Wednesday through Friday 10 to 5, Saturday 10 to 2. For additional information call 870-245-3612. 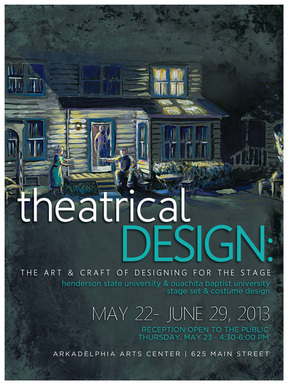 In the Arkadelphia Arts Center Gallery through June 29, 2013. 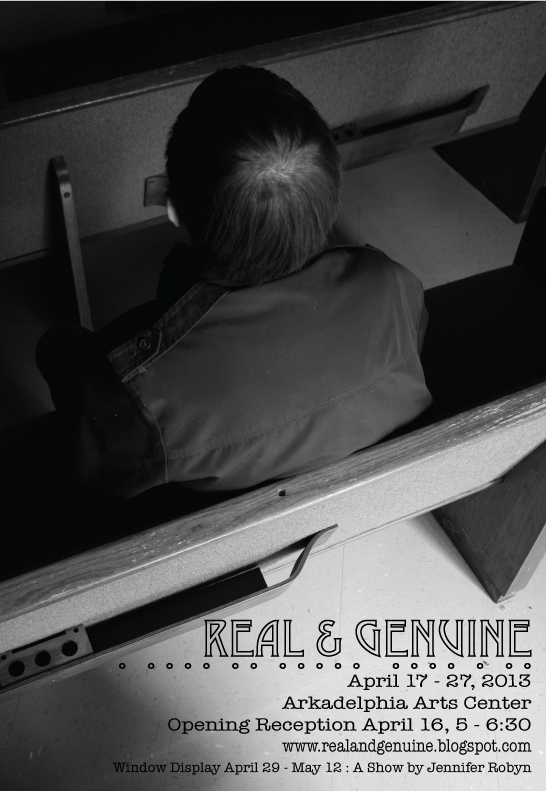 Real and Genuine consists of 12 stories filled with photographs, words, and audio from Christians in the western half of Arkansas about their relationship with Christ. Each story focuses on a particular person, couple, or family. The photographs are mainly environmental portraiture from the time she spent with them. The images are black and white, with sizes ranging from five by seven to eight by twelve. They are framed in repurposed wooden frames that have been painted black. The long and short interviews can be accessed through the blog: www.realandgenuine.blogspot.com In the Arkadelphia Arts Center Gallery through April 27, 2013. 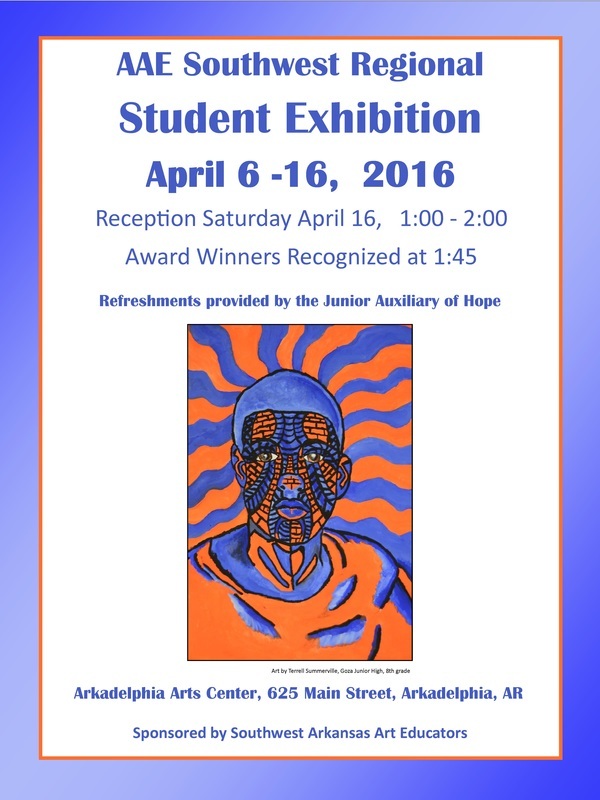 Highlighting the work of Arkadelphia’s Goza Junior High School art students created during the school year. 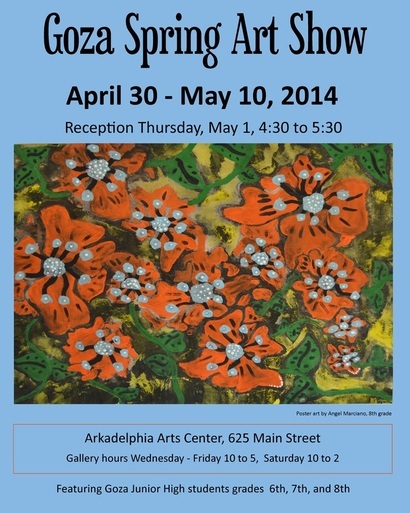 In the Arkadelphia Arts Center Gallery through May 18, 2013. Eight Studio Art and Graphic Design majors are exhibiting this spring. The exhibit spaces are spread around Ouachita's campus and include the Hammons Gallery in Mabee Fine Arts, the lobby gallery of the Verser Theatre and a portion of Lile Hall including the English Department. The artists are Hunter Soper, Rebekah Poynor, Andrea Lock, Courtney Sharp, Rebecca Houlihan, Jessica Caldwell, Nicole McPhate and Grace Anne Thomas. The exhibits will be available to the public through April 30. 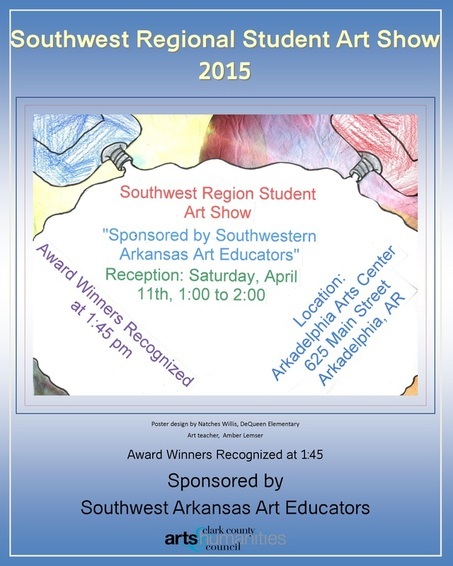 The Southwest Regional Student Art Show, full of colorful and creative art is a show of kindergarten through 12th grade student work from 10 school districts in the southwest region of Arkansas. The first place winners at this regional show will move on to the state competition. The show runs through Saturday, April 6th culminating in a reception, open to the public, from 1:00 to 2:30 with recognition of the winners at 2:00. "Trees and Treasures" exhibit will be on view at the Arkadelphia Arts Center December 5 - January 19. Christmas trees representing the arts organizations in Clark County are throughout the exhibit along with a large variety of vintage treasures including a collection of musical instruments from around the world, small old sewing machines, doilies, a peddle tractor, rocking chairs from the 1800's and much more. Hours are Wednesday through Saturday, 10 to 5, free and open to the public. The trees will be displayed through Saturday, December 29th and the treasures will remain on exhibit through Saturday, January 19th. For more information call 870-245-3612.